Again, dual exhaust and chrome tips are not stock. So sue me! They look mean and sound great. They SHOULD have had them on the TV show, but they didn't. Anyway, rear bumper also has the "bumper protection group." 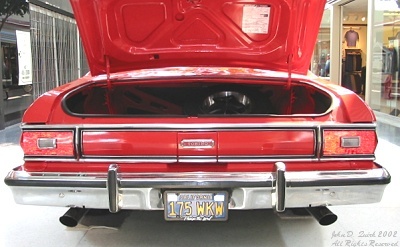 The chrome trim attaching the tail lights to each other, above and below the gas tank door, is unique to Gran Torinos and Gran Torino Sports. Plain Torinos have none.